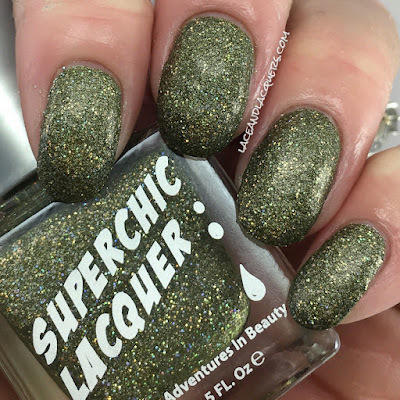 In addition to the Project Runway Dynomite SuperHolo polishes (Swatched: Part I, Part II), SuperChic Lacquer also released 2 new nail items. 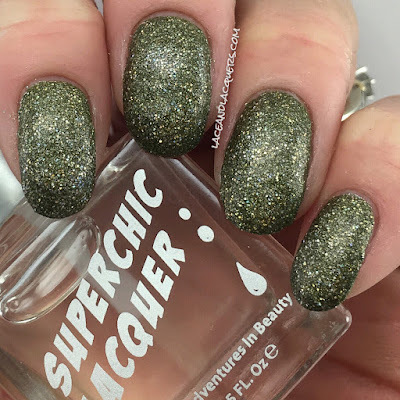 If you're a fan of the SuperChic Lacquer Marvel top coat, check out Marvel-Plus Velveteen Top Coat. And if you're a fan of awesome holographic sparkle, check out the Holo-Pop Intensifying Polish Rub. Review of these 2 new products after the jump! 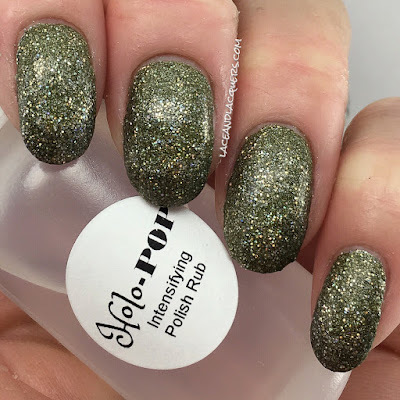 The Holo-Pop Intensifying Polish Rub is a product you apply to dried polish to bring out even more holo sparkling goodness! By applying this you smooth out tough glitters while intensifying the shine. It's up to you if you want to top coat it for a smoother finish, or leave it without top coat for a more textured finish. This is applied VERY gently with a soft, lint free fabric/cloth/paper. It took me about 3 tries to get this right hahah. I had to message Jenn and ask her where I was messing up. She says the trick is to "rub super gently like a feather over the top for just a couple seconds then stop". If a little polish comes off, that's normal. After the first application, wait about a minute and repeat the application and the polish doesn't come off, it just smooths the appearance. Check out that holographic awesomeness! To be honest, upon reading the product description I had doubts. But once I applied it (read: applied it correctly), I saw how awesome it was! 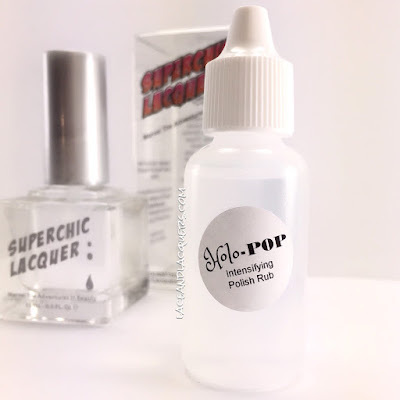 When used correctly, Holo-Pop reveals a ton of holographic glitter and nicely smooths out the texture. I can't think of a product similar to Holo-Pop, so practice makes perfect when it comes to applying. Don't worry if it takes you a few times to get the desired look. Just remember to be light and gentle. If you're a fan of SuperChic Lacquer's crystal clear, glossy Marvel Top Coat (original review circa 2014 - here - also making me want square nails again LOL), Marvel-Plush Velveteen Top Coat offers the same quick dry and long-lasting wear with a different finish. While also smoothing out rough glitters, it features a matte satin (velveteen) finish. I've replaced my super long relationship with Seche Vite with the original Marvel Top Coat. Marvel-Plush a great alternative finish without sacrificing the wear time. Speaking of top coats, let's talk base coats. The Project Runway Collection (Swatched: Part I, Part II) features super high saturated colors that can lead to staining. I did not experience any staining, but that doesn't mean someone else's nails won't stain. 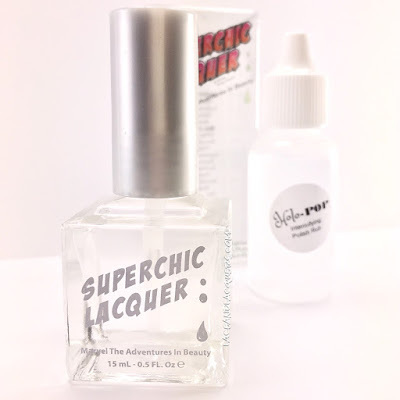 If you're looking for a highly effective stain blocking base coat, be sure to read my review for SuperChic Lacquer's Bring It On Base Coat - here. 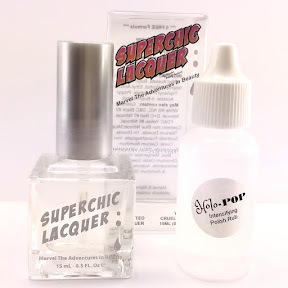 If you order these items from SuperChicLacquer.COM, you can get 10% off your order with code SUPERCHICFAN0415LAL. For more information about this collection, be sure to check out SuperChic Lacquer's social media platforms!